Five years ago when OnePlus first came into existence it was a complete unknown. For tech fans the world over, the brand's promise of a flagship-like device at a much lower price was too good to ignore. It soon got noticed. Now as it is approaching its fifth birthday, the brand is growing its presence in key markets, and is slowly turning into a proper smartphone maker. Never has that been more true than with the launch of the OnePlus 6T. In the UK, it's available from all major carriers (it's not an O2 exclusive anymore), and in the US, those rumours of a partnership with T-Mobile came good. 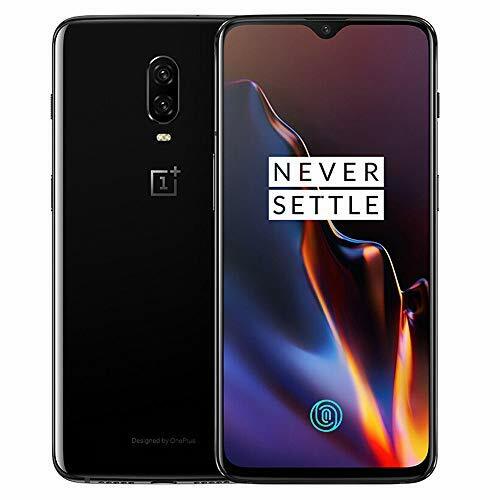 At nearly £500 outright, it's far removed from the super budget-friendly price of the first OnePlus phone, but it's comfortably cheaper than the best flagship phones from the likes of Apple, Samsung, Google and even Huawei - and even in its £649 guise as the McLaren Edition 6T. How different is it to the OnePlus 6? The answer: enough that you can tell the difference between them quite easily, at least from the front. Unlike when OnePlus made a huge leap in screen/front design from the OnePlus 5 and 5T in 2017, the changes aren't quite as striking for the 6T. The biggest visual difference on the front is in the design of the notch. In an effort to cover even more of the surface in display, the notch has shrunk right down to a dew-drop style, and is barely larger than the single selfie camera lens it surrounds. That means the earpiece has been pushed further up and sits right on the top edge. Less noticeably, the bottom bezel (or chin) is ever so slightly slimmer as well, ensuring that the display is more expansive than ever. It's worth noting that the chin is still thicker than the bezel around the sides and the top edge, meaning it still looks a little less balanced than the iPhone XS or XS Max, despite the smaller notch. But, the fact its frame is shrinking is a good thing. The chassis is built predominantly from aluminium, with a finish designed to compliment the colour of the glass on the rear. Our unit is Midnight Black, which has the shimmery matte look identical to the OnePlus 6, while Mirror Black is a much shinier, glossy finish. There's also the McLaren Edition, with carbon fibre detailing and an orange hint to the edge of the rear to make it stand out. Staying true to one of the most important elements of OnePlus design over the past couple of years, the phone feels good in hand. The chassis is noticeably narrower than big iPhones, and those curves towards the edges on the back means it sits really nicely in the palm. The soft-touch glass on the back adds to this feel of comfort too, ensuring it's one of the best-feeling big phones available right now. For any price. It's a big phone that doesn't feel as big as it actually is. In fact, it's actually thicker than its predecessor. Looking at the back reveals that the camera setup doesn't seem to protrude as far as the last one. There's very good reason for this though, which we'll get into more later. Spoiler alert - the battery is bigger. Sticking with design for now, OnePlus says that - even though it hasn't been officially IP-certified - its newest phone is more water resistant than ever. There's a seal between the screen and the battery, as well as foam and rubber sealant around the button switches and the ports. Answer your phone in the rain, or accidentally drop it in a puddle, and it'll more than likely be fine. We weren't keen to test this on purpose though, after all, it's still not something covered by warranty if water does get into the phone. There are now more colour choices than just black and black - not only is there the McLaren version, but you can also get the Thunder Purple in the UK too - so there's plenty to choose from. Another year has come and gone, and another without a QHD resolution display for OnePlus. But, with so many manufacturers now seemingly opting for versions of Full HD or Full HD+, perhaps OnePlus isn't as behind the curve here as we thought. Like the last phone, this one has a huge 6.41-inch AMOLED based panel, which means you still get those vibrant colours, deep blacks and bright whites. It might not be the sharpest around, but the screen on the front is still very impressive to look at. That dew-drop notch along with the skinnier bezel, makes for an even more immersive visual experience. At 401 pixels-per-inch it's still plenty sharp enough and has a bunch of modes to please pretty much anyone, even fussy screen nerds. As well getting the usual handful of calibration modes, there's a return of the Reading Mode which turns the screen greyscale and increases contrast to make it appear more E Ink like, and there's Night Mode for reducing blue light later on in the evening. All of this combined means it's a great display for just about any kind of media consumption. Whether you're reading e-books, playing the latest games or watching movies, it all looks fantastic. Part in thanks to the vibrancy of the OLED panel, but also because of how much of the front it takes up. Your content dominates the device, and sits so close to the surface that there's just nothing between you and the media. Add all that to the fact it takes up 86 per cent of the front surface, and is covered in the latest Corning Gorilla Glass 6 for the best durability currently available, and you have one impressive piece of display tech on the front. The only thing missing is that extra push in resolution. It's not fuzzy or pixellated, but some of the finer details don't look quite as crisp and sharp as they do on the likes of the Galaxy Note 9's display. Is the in-display fingerprint better? In the past, OnePlus hasn't been the first to jump on emerging technologies, often priding itself on waiting and seeing if something is taking off or not. So it is a little surprising to see in-display fingerprint sensor tech making its way onto the OnePlus 6T. The company states that the tech is more developed and reliable than it was when we first saw it demoed by the likes of Vivo and Huawei. Having used it for a couple of weeks now, there's no doubt that it's better than the first iterations of the technology. It uses an optical sensor beneath the display panel and shines green light to ensure the maximum detail is captured when registering your fingerprint during setup. As we saw with the Huawei Mate 20 Pro, the setup is pretty thorough, making you take time to capture a lot of detail to begin with. When it comes to unlocking, it's been about as reliable as the physical sensors have been previously. Most of the time, it detects the fingerprint accurately and unlocks the device. There's the odd occasion in a day when it will fail to recognise, but a quick adjustment is enough to rectify that issue. One thing is for sure though - it's not quite as fast as previous physical sensors. At least, not in real life. OnePlus claims it can unlock within roughly 1/3rd of a second, but it doesn't feel quick as speedy as the fingerprint sensors we've used before. Despite that, it's certainly not slow, and doesn't hinder daily use or add excessive frustration to the experience. As previously, there's also the option to use Face Unlock. This is a little faster, but nowhere near as secure as using the fingerprint sensor, mostly because it only uses the front facing camera to recognise faces and - unlike iPhone XS or Oppo Find X - doesn't have extra depth sensors to measure contours in faces. It also doesn't care if you're looking at the phone or not, unlike the iPhones, which wait for eye contact. If there's one thing you can always count on from OnePlus, it's that its phone is a prime example of finely tuned, but stupidly powerful internals. Nothing but the best components will do, and that's why the 6T has been fitted with the impressive Qualcomm Snapdragon 845 platform. Combined with the 6GB or 8GB RAM (depending which model you get), it's one of the fastest, most powerful phones on the market. And it shows. In daily use, whether you're loading up apps or games, the experience is one that's quick and effortless. There's no real delay to anything, with even the most graphically intense games loading up in good time. The OnePlus 6T McLaren Edition gets a bump to 10GB and while that sounds like a huge jump forward, from our time with the phone so far, it's hard to tell if that's making a huge difference; it's almost a moot point though: the OnePlus 6T McLaren Edition is only £70 more expensive than the 8/256GB version of the phone and for that you get the faster charging, a case and other McLaren themed goodies - so it's still good value for money. Everything that the OnePlus 6T does feels fast, there's snap and immediacy throughout Oxygen OS, making for a great daily experience. What's more, OnePlus has shown through previous devices that the background optimisation helps keep its phones fast, even as they get older. Bigger battery, but does it make a difference? At 3,700mAh, the 6T's battery joins the ranks of some of the most capacious tanks out there, knocking on the door of the likes of Huawei's Mate 20 Pro, P20 Pro and Samsung Galaxy Note 9. In all our time testing the phone, regardless of how busy our day was, we never needed to plug it during the day after taking it off charge in the morning. It wasn't strides better than what we experienced with the OnePlus 6 overall, but with only a 12 per cent increase in capacity, it'd be foolish to expect that. Still, it meant on moderate days we were much closer to 50 per cent than 40 per cent at bed time. On busier days, we still struggled to get it to end the day under 30 per cent. Perhaps the one thing missing here - being that it's a trend in 2018 - is wireless charging. Ask OnePlus and they'll argue that wireless charging isn't fast enough to bother with, instead opting for its tried, tested and loved fast wired charging. But, there's an argument to be had here about the convenience of wireless charging stands, especially when putting the phone down at night. What's more, Google has shown with its Pixel 3 lineup that it can be used to enable extra useful features. While wireless charging isn't available from OnePlus yet, its wired charging is fast. With its rapid charging technology, you don't need to leave it on charge over night any more. Instead, wait until the morning and plug it in while you're getting ready for work. If you get nervous at the 25 per cent mark, you can plug it in for just 25 minutes and it'll be back up to around 70 per cent. Even if you plug it in when it's completely drained, just 30 minutes plugged in is just about enough time to give you a day's worth of power. For the McLaren Edition of the phone, there's the debut of a new charging standard - Warp Charge. Referred to as Warp Charge 30, there's a 5V/6A charger in the box, enabling faster charging of the phone. That means that you'll hit 50 per cent charge in 20 minutes rather than 30 on the regular OnePlus 6T. Despite how convenient it is, OnePlus - for the first time - isn't the fastest smartphone charging on the market. It's about half as speedy as Huawei's latest 40W super charging on the Mate 20 Pro, and Oppo's 50W Super VOOC technology, both having come to market in recent months. The silver lining here - to a cloud which isn't especially grey to begin with - is that Oppo technology often makes its way to OnePlus phones, and perhaps we'll see a rapid charging tech on the OnePlus 7 that matches its Chinese cousin's performance. Unlike previous years, OnePlus has really jumped onboard the Android Pie train from very early on. It was among the first to offer beta versions to its customers, and wasn't far behind Google's own Pixel efforts in rolling the official version out to OnePlus 6 owners. That means, for the first time on a "T" version device, it comes with the very latest version of Android right out of the box. Along with Android 9.0 Pie comes OnePlus' usual lightweight and customisable Oxygen OS software, as well as some new navigation gestures. Similar to the Pixel - but not exactly the same - you can enable a navigation method that uses a swipe up on the virtual "home" button to access recent apps, or swipe right on it to quickly switch between them. Unlike the Pixel though, you can still bring up the app drawer with a quick swipe upwards on the home screen. No second, or extra long swipe required. Other useful additions include the ability to use your power button as a key for launching Google Assistant, as well as the ability to change your phone's entire theme, including installing and using custom icon packs without the need to install a third party launcher. Each year, OnePlus improves its camera hardware and algorithms, and the same is true of the 6T. Although in this case, it's more of an algorithmic change than hardware-based compared to the 6. That's to say, it uses the exact same camera lenses and sensors as the OnePlus 6. But there is a difference. Low light shots and HDR have both been improved with a touch of AI magic. Switch it into Night Mode or just shoot a shot in low light and you'll be impressed with how much light it can draw in. This night mode is fairly similar to what we've seen from the likes of Huawei and Honor in recent months. You can hold your phone in your hands while the camera takes in light over a few seconds before artificially stabilising and producing an image that's blur-free, with lots of light. The only problem we found here was that often times in low light, some of the finer details were lost in process, make an image look quite soft in places. With HDR in auto mode, the camera detects when there are harsh lighting conditions and adjusts the colours, contrast, shadows and highlights to make a balanced photo. We tested it in a number of scenarios and found it to do its job pretty well. Some images had a bit less detail than we'd like, or overblown colours or brightness, but on the whole, it's much better to have a phone with hard-working HDR than without. Still, we don't think it's quite on par with the iPhone XS or Pixel 3 in this regard. The major plus here is that it's not too far away. For pretty much any regular smartphone user, the camera is more than good enough and capable of taking colourful, detailed shots prime for showing off on social media. For the slight improvement, it's probably not worth paying an extra £300 to get a "proper" flagship. Over the past few years we've seen OnePlus change from a company that only releases phones with features that its passionate community want, into one that's trying to appeal to the general consumer. Gradually, with each new phone we've seen, once-proud features like the headphone jack, solid metal unibody construction, fingerprint sensors and capacitive navigation buttons have all been removed in the name of progress. That's not to say the tech fans are ignored. OnePlus 6T still uses the most powerful Snapdragon processor going, has really fast charging tech, a smaller notch, a big battery and a better camera than before. It may not be as exciting to look at as the multi-coloured layered glass on some other manufacturers' phones, and hasn't been overloaded with loads of additional features or a heavy skins, but to some that's a good thing. It's solid, quick and performs day-in, day-out and does so without breaking a sweat. If you have a OnePlus 6, you're not likely going to need or want this upgrade, but from every other previous model, this is going to feel like a massive leap forward. Because - despite its more premium price point - as far as performance and quality for the money goes, OnePlus is still knocking it out of the park. Why pay more? If clean, pure Android is what you crave in a powerful, portable package, the Pixel 3 is an ideal smartphone. It'll always be up to date on the latest software, and with the most recent security patches. It feels fantastic, and is water resistant, with one of the best displays on the market. What's more, it has one of the best cameras on any smartphone right now. If what you really want from an Android phone is lots and lots of battery as well as an incredibly smart and capable camera system, the latest from Huawei has you covered. As far as value for money goes, Honor has really been pushing hard this year, creating some great looking and powerful pieces of hardware available for a price that undercuts even OnePlus. One of its best offerings is the Honor 10, complete with its attractive layered glass back and impressive performance. What's more, it's only £399.